I want to first offer a congratulations to all students who presented. Please do not take my impressions of your projects as being too critical. I realize you were on intense deadlines and each group members have different levels of game development skills. As I discuss each project, I will give my gut overall feeling and describe what I liked and the things which may need improvement if you choose to further work on your projects. I'm including the links to the individual project websites found on the main site so readers can get more information on the games. Also forgive the picture quality as I took most of the pictures without flash in a dark auditorium. I luckily did see the entire The Bridge demo. I would describe The Bridge similar to the Star Trek Bridge Commander where you can give orders to your crew and pursue missions in space. The draw for The Bridge is you can give orders to your crew and ship by using your own voice. The person demoing the game started a mission where an alien merchant captain was requesting to come aboard and speak to the captain. Instead of selecting the traditional “Yes”/“No” dialogue options from a menu, the person replies with a voice command from shown dialogue options. 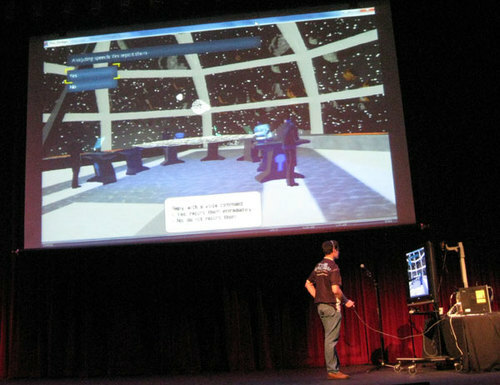 For example, the player decided to let the alien captain come aboard and said “Yes, you may come aboard”. The voice control system did a excellent job of understanding what the player was saying and if it did not completely understand the phrase, the person could say each word individually. The only issue was the presenter was trying to say the phrases loudly so the audience could hear him which was probably causing distortions for the voice engine. When he spoke the phrases normally, the game had no problem understanding him. In this mission, the aliens had a large amount of ship weapons which only humans could operate. The alien captain wanted the player to help them deliver their cargo in exchange for four new ship turrets. The player played hardball and asked for eight turrets to which the alien agreed. Next in a total betrayal move, the player chose to report the merchant ship and could collect 50,000 credits for destroying it. Of course the presenter decided to vocally move within striking distance of the merchant ship before yelling to his ship “Weapons, fire everything!” The captain then used the newly acquired turrets to destroy the unarmed merchant ship with a ton of red laser lines. I enjoyed the crew banter afterwards trying to get their individual departments a cut of the space credits. The Bridge is successful in allowing people to live out their own Star Trek captain fantasy. Voice commands appear to work well and I enjoyed hearing the person speak out the responses. The goal of Quicksilver: Infinite Story is to take the appeal of cartoons and anime we grew up with as children (like Batman) and apply it to a procedurally generated storyline and game. The game is half arcade brawler with three planes of combat and half train crewmember RPG. The train is where the party lives and I guess it is transporting them to the next mission or maybe cities. 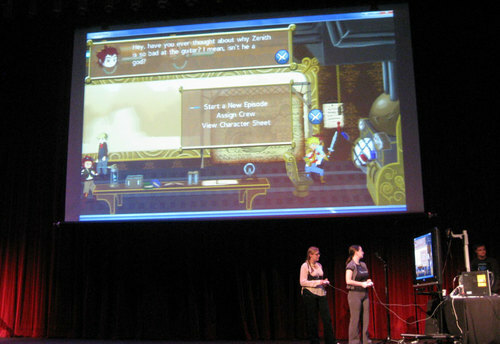 In the two player demonstration, the team picked a mission and begun the combat section. Each person could navigate the three battle planes and attack enemies. The team said the town level was procedurally generated using random town art assets and enemies. I’m not sure if the action segments dialogue was randomly generated or would always appear. The battle elements included the ability to lift enemies into the sky and attempt to aim them at the other player to do extra damage. There was also a special attack which varied for each character. After clearing about two screens of enemies, the game shifts back to the train for mid-mission dialogue. The conflict for the train during this mission was a reformed demon (which looked like a cat) wanted to join the crew. One of the crewmembers was very suspicious of her and didn’t want her aboard. After the brief dialogue, the game returned for more arcade combat before returning once more to the train. This was the time for the red headed train captain to decide if the demon would join the crew. The team asked the audience if we wanted her to join the crew and we said “yes”. Thus she joined the crew and the player assigned her to the medical compartment of the train where she would be able to increase her skills. The team said all actions have consequences and because we let her join, the suspicious crewmember lost respect for the captain and I remember overall train moral or some other stats dropped. After the train decision, it was time for the boss. The boss spoke to the party briefly before she charged her lasers. Her big laser attack completely missed and hit only the middle plane. Then she teleported and left herself open to massage damage from the team members. It took only two repetitions of the boss movements before the party meleed her to death. I did enjoy the boss’s “No, this is impossible” dialogue since to me she was probably barely stronger than the prior enemies (perhaps for demo purposes). There is definite appeal for each mission to play out differently with different characters joining the crew. I would maybe focus on tightening up the arcade combat as the train dialogue/class portion seems robust. Paradox Shift was described as a first person perspective, puzzle solving and a small amount of action. The game is using the Unreal Engine and tells the story of a dam being built on the Grand Canyon using time travel elements to speed up construction. The player is a female inspector tasked with making sure the company is not breaking any temporal rules which I am sure they are. By using the T3 device, the main character can jump forward (one week) and back to the present to get around obstructions and solve puzzles. Pretty interesting it only takes a week to build a dam when there is infinite time within that period of time. 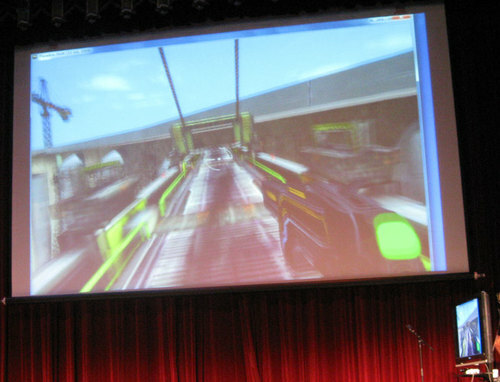 The team showed off one of the later levels where the player can use the gun to “tag” objects and move them through time to solve puzzles. Eventually the player reached an office lookout where a crane collided with the building causing it to buckle. The player then jumped to the crane and there was a spectacular collapse of the building the player was standing on moments ago. At this point, the crane also starts faltering and the person moves toward the dam scaffolding. I really enjoyed the dynamic feel of the building and crane coming down in such a short period of time. I later asked a member of the team what would happen if the player decided to teleport during this sequence and he said there would be no building which would cause the player to plummet to their death. On the scaffolding, the player chases down a mysterious man who just appeared. The man also has the time gun and shifts between the periods as you move along changing walkways. At one point the player jumps on a metal chute and slides down the ramp shifting to avoid objects. Unfortunately at the end of one of the ramps, the game was hitting an invisible wall or having some collision detection issues. The team tried to use console commands to go around the issue but it resulted in the game crashing. I was impressed the development team could create an exterior dam level with so much scripted destruction. The hybrid Portal + Mirrors Edge inspired game works well and I want to play through the game if/when it is released publicly. Unchained is a game centered on steampunk inspired airships trading with other nations. 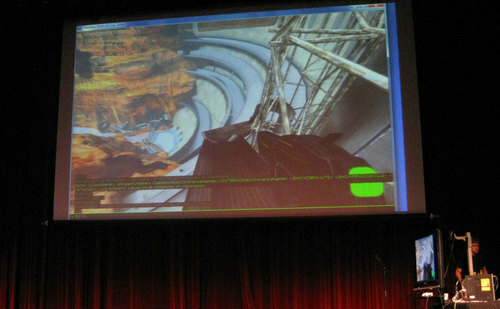 You control a female captain Mira who commands a large airship. She must trust her instinct and her awesome mechanical butler to defend their cargo from air pirates. 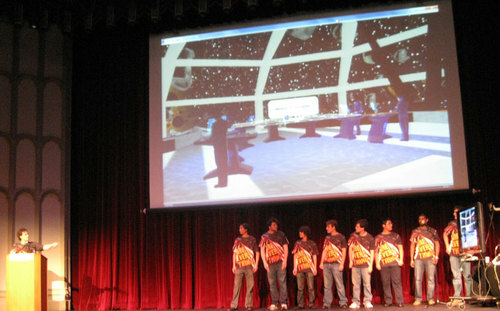 The development team said they spent a long time building the game and graphics engine. It definitely shows with a detailed, lush world with a slight amount of cell shaping. The artwork is top notch for this game and the team’s concept art shows they spent a lot of time making sure everything was thought out. Unchained seemed like it had one of the largest team sizes and their website shows they have at least 15 dedicated artists. The team showed off one of their air missions where Mira was attacked by air pirates. The main gameplay appeared to be destroying the circling pirate fighters while being able to individually man one of the ship’s cannons. By interacting with the robot butler, Mira can switch out different turrets as she collects new ones. There are cannon locations on the bow, port, starboard and one in the crow’s nest. She could take an elevator to the top level where she can target in the full 360 degrees. One caveat of the gameplay was there just appeared to be waves of pirates coming in and there wasn’t much difficulty aside from running from cannon to cannon. The demo ran into a minor glitch where the airship was getting shot at by an invisible enemy. The person playing the demo tried to find the ship for about two minutes before giving up. The graphics, character modeling and design and world look amazing for being one year worth of work. I really would have liked to see what else the game could offer as there seems to be a lot of potential. A new form of dancing that warranted bringing out a disco ball? Well, I’ll talk about Dance Pad in a future article as well as the other mobile games shown after the catered lunch. I thank the major companies like EA, Microsoft, ActivisionBlizzard, Bungie, Konami, Intel, Zynga, Bally, Wild Needle Games and CorpInfo for giving everyone attending a free lunch. Such delicious stuffed mushrooms! 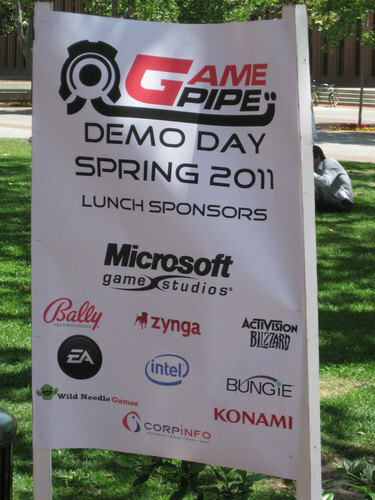 * Part 2 of the USC GamePipe Demo Day is done. It includes all the mobile and iPad game demonstrations as well as the remaining Kinect class games.